Director Fatih Akin broke into the film making scene with small films on gypsy music. He has come a long way since with his new film IN THE FADE. IN THE FADE stars top German actress Diane Kruger, which won her the Best Actress Prize at Cannes in 2017. She totally deserves it and IN THE FADE is an incredible film that attests Akin’s prowess as a filmmaker. The film also tackles the current problem in the world of racism and prejudice, looking at the face of neo-Nazism. The film is named after a song by the American rock band Queens of the Stone Age, whose lead singer, Josh Homme, wrote the film’s score. The film opens in a prison setting. The inmates are cheering a prison wedding where Kurdish inmate, Nuri Sekerci is being wed to German Katja (Kruger). The story moves to the present in Hamburg, when Nuri is out of prison and has a business in helping the needy. They now have 5-year old son. Katja met Nuri when she bought hasish from him. Since the birth of their son Rocco, Nuri has quit drug trafficking, studied business administration while in jail, and now works in Hamburg at a translation and tax office. Akin shocks the audience with the sudden death of Nuri and his son by a bombing, just when one expects Nuri to be the main protagonist, similar to the Janet Leigh character being killed off in PSYCHO. No doubt an old trick, but one that still works. It turns out that the killers are neo-Nazis. After they are acquitted, despite damming evidence, Katja decides two things. There is no purpose in her life and longer and that she wants justice and revenge. No more should be said of the plot to prevent any spoilers. Akin’s IN THE FADE moves along smoothly with nary a dull moment. He succeeds by inserting various different events like the courtroom drama, the impact on Katja of both her parents and parents-in-law, her sister’s pregnancy and daughter and her own turmoil. One does admire Katja’s strong character though she breaks down doing drugs at several points in the film. But it shows the strength of her love for both her husband and child. This is revisited in home footage she views of her son and husband at the beach, the segment that finally cracks her up. A different look at the law is also observed. The investigating officer initially is biased against her because of her husband’s racial background, but he eventually takes her side at the court hearing. Her lawyer, Danilo Fava (Denis Moschitto) is also sympathetic, always probing her on, and never to give up on justice. Any romantic involvement between the two is halted immediately with the line Fava utters that he has to drive his kid to kindergarten the next morning. 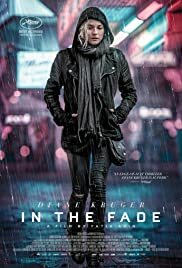 IN THE FADE is also this year’s German entry for the Best Foreign Film entry at the Academy Awards. A good choice. It just won the Golden Globes Prize for Best Foreign Film.